Local Attractions - Chapel Apartments, Llansaint, Wales. 1 1/2 Miles walking distance from the chapel. The Norman Castle in Kidwelly built in 1200 AD stands majestically on the banks of the River Gwendraeth over looking the medieval town. Considered to be in the top 5 geatest casles in Wales. 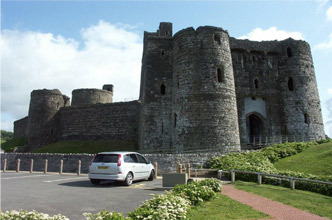 There are seven castles in Carmarthenshire with Kidwelly considered to be the best presereved, and largest. 2 miles from the chapel lovely walk. 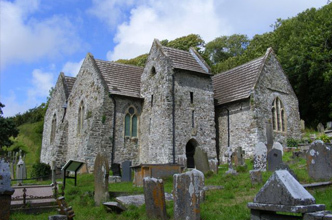 The beautiful medieval St Ishmael Church on the ancient pilgrim route to St David's which is still in use today was built in 1100 AD. It served a thriving fishing community until the 14th century. Archaeologists have determined that the village or town was destroyed by a great storm or tsunami. The church now stands alone made safe by its elevated position on the hillside seemingly without a congregation, but the town it served still remains under the sand. 15 minutes drive from Chapel Apartments. The nearest beach is at Ferryside 6 minutes drive. 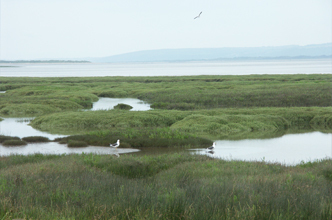 Pembrey Country Park is a major tourist attraction in this area of Wales. It is a 500 acre park which includes access to Pembrey or Cefn Sidan beach. 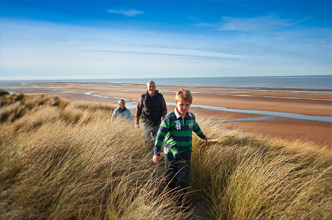 Pembrey beach is 8 miles long of golden sand and miles of sand dunes. The Pembrey Park access to the beach is Blue Flag so there are life guards on patrol on this section (seasonal). There are also good well kept toilets, and food & ice creams available. This part of Wales has the largest golden sand beaches in the UK. Pendine Sands beach, the Gower Peninsula, and Mumbles are also in Carmarthen Bay, and are easily accessible. Pembrey Country Park: Is a 15 minute drive from the chapel. 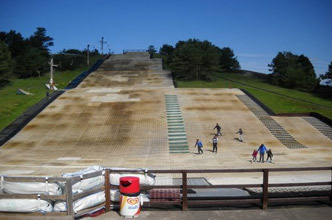 There are many activities in the park some seasonal. 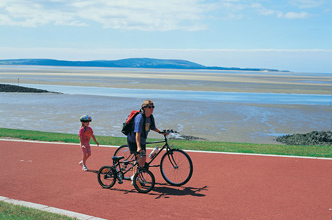 The park covers 500 acres in total which includes Pembrey Forest, walks and cycle routes in all directions. There is a dry ski slop in the park and COBRA. COBRA is a bob slaigh run which travels up one side of the ski slop (you are pulled up by a rope) and then you bob sleigh down the other side. The kids love it, and its only £2 a go with multi ticket discounts. There is a restaurant, and visitor centre including crazy golf and other acivities in the park. Just down the road an area of special interest. Internationaly recognised as a bird sactuary, and outstanding natural beauty. The Kymer Canal which runs for 3 miles was the first canal to be built in Wales in 1766. There are winding paths through the meadows, and numerouse foot bridges along the way. There are lawned area's with picnic tables, and great views out to sea. Free parking a great afternoon walk with the kids, or just on your own. Wild horses also in this area. A great day out with beautiful beaches either side of the harbour. Lovely walks and a lighthouse. Ice cream's sold most of the year. Parking 30p per hour. Easey access to the Millennium Coastal Path. You can hire bike's here. 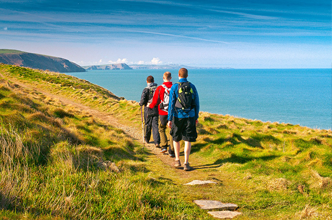 The Millennium Coastal Path is part of the Celtic Trail which travels from Fishguard in the west through Carmarthenshire to Swansea, and then on to Hay On Why in the Black Mountains. The Millennium Coastal Path is a top quality section that runs from Burry Port to Just past Llanelli. About 13 miles of coastal tarmac path (no cars) which includes numerouse monuments, and breath taking views, and a choice of golden sand beaches along the way. You should enquire if you are intending to bring bikes with you. 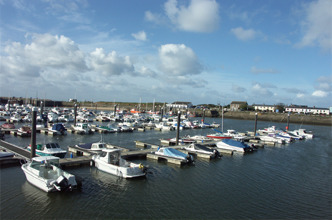 You can hire bikes from Burry Port. Tel 01154 835895 shop hours. 15 minutes from the chapel. 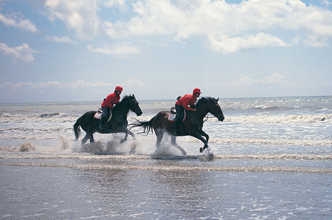 Pembrey Country Park includes its own stables where you can ride on the beach or through Pembrey Forest. (Pembrey Park Riding Centre tel 01554 835191). There are other riding stables in the local area. Carmarthenshire is officially recognised as the garden of Wales. 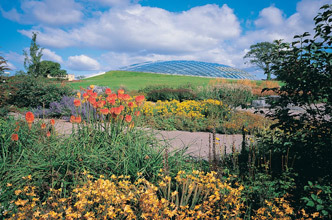 The National Botanic Garden Of Wales houses the worlds largest single span glass dome. Its a great family day out, and well worth a visit. Aberglasney Gardens are also in Carmarthenshire, and well worth a visit. We all love steam trains. 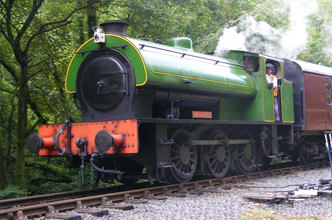 "Gwili Steam Railway" is our local, and a great day out. Check out there website for details. Ride and dine, Murder mystery, Jazz evening's Corporate events or just go and look. Note: A good pair of walking boots are essential. Pendine Sands require a modest drive of about 45 minutes. There are caves on the beach which the kids love. Steps have been cut into the cliff off the beach. Great walks along hear. Be sure to visit the historic town of Laugharne on the way home, they are only a few miles apart. There is a castle in Laugharne also. The Brecon Beacons cover an area of 519 square miles. To drive from Chapel Apartments to the Beacon's will take about 40 minutes. 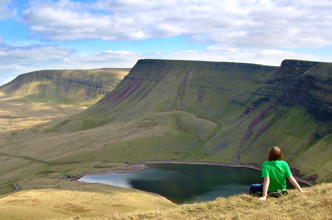 The image shown is Llyn y Fan Fach in Carmarthenshire. We strongly recommend you research the area you intend to visit on the internet before you arrive. We do have maps and information in our visitor information area, but it is general information.